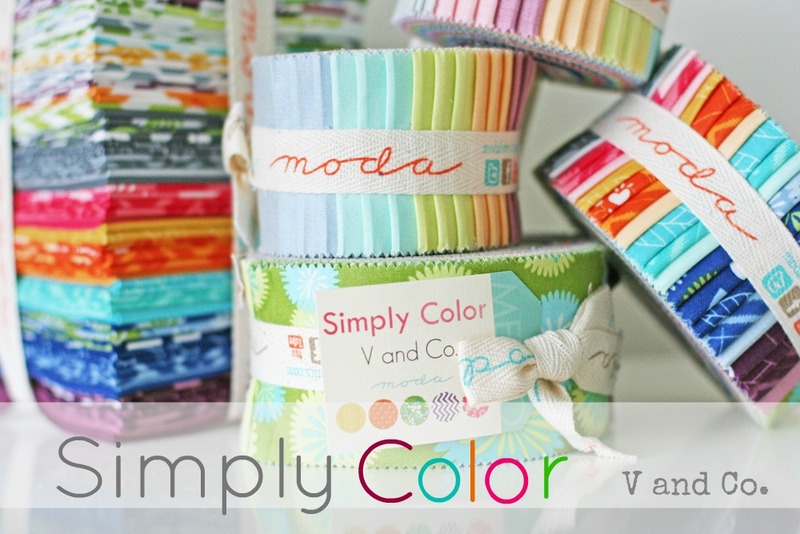 introducing: Simply Color by V and Co. (that's me) for Moda. debuting at spring market 2012 in Kansas City. yes, i'm pooping my pants. yes, i want to cry i love it so much. yes, i am sewing and sewing and sewing. YES, that is why the blog is so dang quiet, and the projects have been minimal. BUT, all this planning and sewing and creating chaos is almost coming to a hault (well we're in the tornado of chaos at the moment...) and after spring market...i should be FIRST having a melt down and THEN we will be back to normal...oh who the swear word am i fooling? there's always going to be some kind of crazy, and in between all the crazy there will be crafting. and so we will go back to or rather CONTINUE the crazy, but now you can know for a fact that a lot of my projects (patterns for sale AND on the blogaroo) will be made it this lovely stuff. you actually see that in fact each strip is ombre. it means each strip consists all different shades of the same color. it goes from dark to light on the bolt. i have some fun stuff i'm doing with it to show off just how cool ombre on jelly roll strips are and of course how cool it is to have lots of shades of the same color all on one bolt. so what say you? you think ombre is as cool as i do? Labels: moda fabrics, modern quilting, ombre fabric, pre cuts, solid fabrics, V and Co.
Congratulations, and that fabric looks awesome! I can think of lots of fun things to make with it! Way to go! I acn't wait to see some more pictures of those prints and projects you have been working on! CONGRATS! This looks like a fantastic line, looking forward to seeing your projects made with it! Yeah for you! And goody for us as we will get to enjoy the fabric luciousness. Holy for-reals, I LOVE it! Congratulations! Will absolutely be making my daughter a quilt for her first big-girl bed with the ombre! LOVE! Congratulations! These are beautiful. I cant wait to see what you do with the ombre. Vanessa! How freakin awesome! What an accomplishment. Love the palate,i will definitely check out your lines. Where are they being sold online? You should be so proud of yourself! Wow! I saw a post from Fat Quarter Shop this morning about this and quickly became a fan. Gorgeous colors and finding out they are hombre makes them even better. 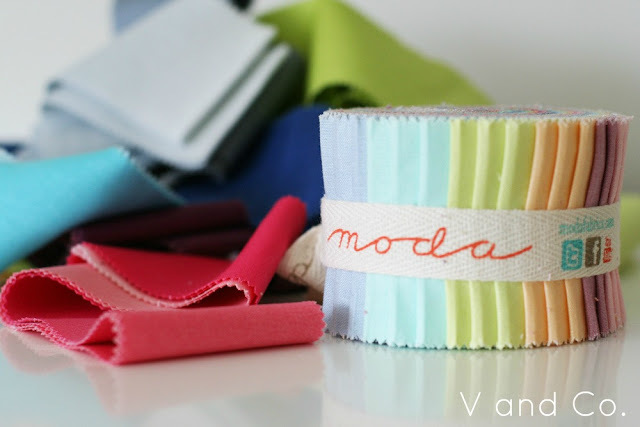 Looking forward to getting to know you and your fabrics! So excited for you! Love the ombre and can't wait to get my hands on some. These are the coolest jelly rolls I've ever seen. The fabric is truly beautiful. Congrats! Love, Love, Love it. I want it all...can't wait to see more of it! Congrats - love the ombre!!! Hold the flipping phone!! Did you say OMBRE???? Be still my heart! This is beyond exciting. I can't wait to see all the delicious projects you have in store. I knew you've been keeping a big secret, but I had no idea it was your own fabric!! That ombre is incredible. Ingenius!! Can't wait to see the whole line. These are beautiful!! The unrolled jelly roll made me do an audible gasp...sitting in a room by myself. BEAUTIFUL colors! Just beautiful!! A huge congratulations to you!!! ombre too?!?!?! SHUT. THE. F. UP. That is the coolest thing I've ever seen. Having all those color variations in one 2" strip? Holy Crap girl, you deserve medals and stuff. Can't wait to get my hands on a few of those jellies. And I don't usually do jelly rolls... but this? THIS? F.ing. brilliant. 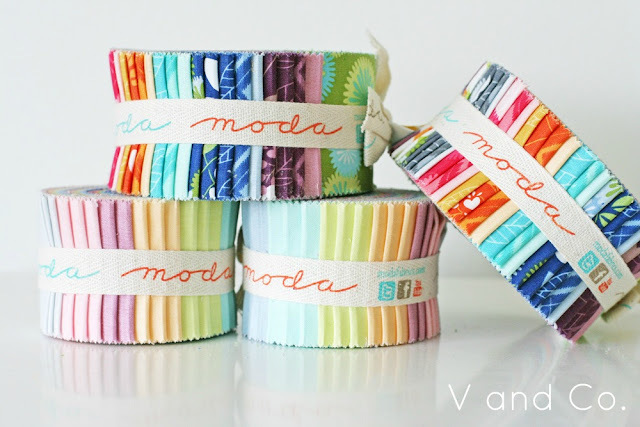 I can see a few projects in those pretty jelly rolls too. How do I sign up for some? LOL, My LQS should have some after Spring Market right?? I need this in my life. Right. NOW. Gorgeous work girly! Lovelovelovelove the ombre. All hail the Queen of Ombre!!! :) Congrats, V! Wow! That is cool! Congrats! Congratulations of Course! But I'm totally laughing because of your post about Target and thinking about the bowls you bought. Of course you HAD to have those. That whole collection is about OMBRE! Sneaky girl! oh my goodness! how fabulous! congratulations! yippy!!! it looks so so amazing vanessa, no wonder you're crapping your pants. heh. can't wait to see more of it! LOVE the ombre idea! Can't wait to see it in person. Very sneeky throwing in that little Ombre post right before you hit us with the big news! Way to go I can't wait to get my hands on some. Wow!!! Congrats. Love the ombré. Ombre...oh my gosh...it's amazing! And I can't wait to see the rest of the line...up close and personal! Congratulations!! It is all gorgeous, and LOVE the ombre. Can't wait to get my hands on it! whoa whoa whoa! That's awesome and the ombre is double awesome! Fantastic! Congratulations to you and what a great surprise for us! Congrats. 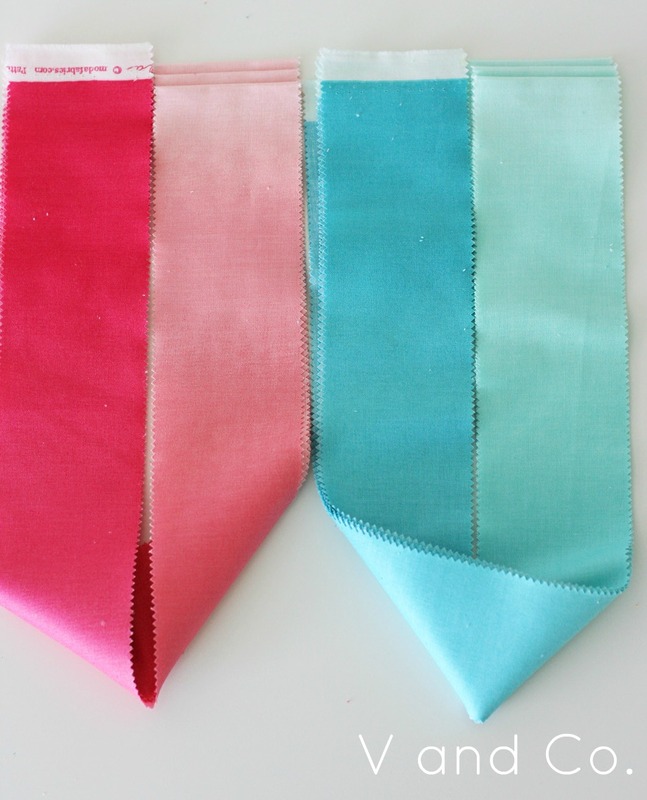 I think it will be fun to see what one can create with the ombre fabric. Congratulations! Your fabric is SO pretty! I can't wait to see it all spread out so I can admire the prints too. Congrats!!! These look amazing -- can't wait!! Simply love them - Congrats! My gosh, I love it!! Ombre? Shut up. That is just freeking awesome! Can't wait to see what you do with that ombre fabric. I'm not as creative as you so I think I would just pet it until someone showed me what to do with it. And, of course, congratulations on your first ever fabric line...and for keeping such a big secret for so long. That couldn't have been easy. That is so freakin awesome! Congratulations! Oh wow! You are amazing!!!! A line of fabric!!! Congrats and can't wait to see them and all the projects you'll come up with. I want it all! Great job! I just found my new love. Your fabric line rocks!!!! Major Congrats!!!! So how does one get a hold of these luscious fabrics? you continue to get me in trouble with my husband for spending too much money on stuff ;) translation: I love it! Can't wait for it to come out! Ombre jelly rolls, are you kidding me? Too cool for school! Love this idea! Congrats on your debut at Quilt Market, so exciting! Super cute!! I can't wait to work with it! WOW I love it and man, congratulations!!! Eeeep!! Vanessa, I am so so so excited for you! I cannot wait to see it all in person and those ombre strips look freaking amazing! I think Ombre is totally Amazing!!!! Congrats!!! I am so excited for your new line and can't wait to get my hands on some of that Ombre!! Ombre is awesome!! Congrats!! I'm so happy for you! Dude, totally can't wait to sew with this! The ombre is A. Mazing. congrats on your first fabric line! It's GORGEOUS! I love the ombre's!! WoW! The fabric looks awesome! I know you must be glowing! Good luck at market!!! Way to go! I can't wait to get my hands on some of that! LOVE it!!! I need some! The fabric looks gorgeous! Love the colours...I soo need to get some of it! I'll be at quilt market this year. I'll be RUNNING to your booth during sample spree! See you in a month! Yes yes yes!! So very cool. Love it. Love it! Congrats! Can't wait to get some - so many ideas floating around in my head for those ombres! Olá.Agora eu entendi o seu post anterior...e eu usando o seu bom gosto com as taças para começar um grande trabalho com aquele degradê.Se eu soubesse que teríamos essas maravilhas,eu teria esperado...Fui em tantas lojas de tecido para comprar cores aproximadas, azar o meu...Já cortei e comecei costura com o que eu consegui.PENAAAA!Parabéns por tudo.DEUS continue te iluminando e inspirando. Yeah! Congratulations!!! Your first fabric line... I knew it was a matter of time and Moda would scoop you up and keep you with their other talented designers! That is so exciting! That is so cool! I love the gradual colors of ombré. Got to get me some when they come out, yep definitely. Love the Ombre idea in a jelly roll. How exciting for you - move over Sweetwater there's a new favorite in the house - V and Co. Can't wait to see the whole thing. Congrats! I can't wait to play with it!! woot woot! way to go!! Congratulations!!! OMBRE goodness!! what a SUPER great idea. i LOVE it. Can't wait to grab some up! I am in love, going to check when FatQuarterShop will have it in! congrats..aren't you just a tight lipped wee bugger now. who knew this was up your sleeve?fingula turrecdi Well done girl. OMG! I am drooling over the ombre! Can't wait to purchase it! I was stumped by the Target ombré post, had even googled ombré to try to figure out what you meant!! Is she coloring her hair?? Now I totally get it! Congratulations!! So happy for you! Beautiful - so very lovely - I could go on and on. When and where can I get my hands on this sweet, beautiful fabric??????? Beautiful! Will look fantastic with your pleated pillow cover! OMGoodness!! 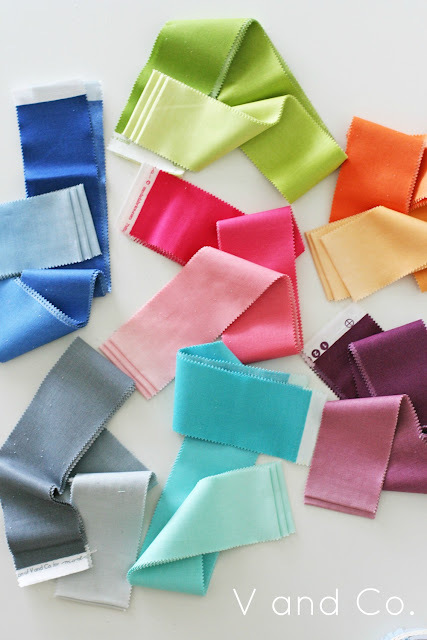 these fabrics are wonderful and the colours....the colours are to die for! Oh good heavens! How cool is this!!!! I can't wait to see it all in person. If you *ever* need anyone in Iowa to test drive your new fabric...I'm you're girl!! Those are beautiful! You should be very proud!!!! V, You are a genius! Ombre on the same bolt of fabric is just way too cool. As always you know exactly what we want and need before we do!! A huge congrats, I know your line will be a big hit! Brilliant Ombre Fabric! Congratulations!!! 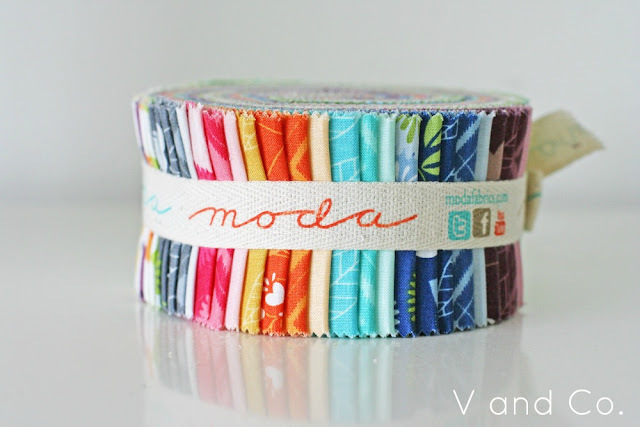 And you must unroll that jelly roll or spread out a charm pack and let us see all the designs! I can't wait! They are fantastic! Great idea about colours! Congrats!!! The colors are gorgeous and I love the ombre. Fabric looks amazing! You must be so excited! Congratulations! So exciting! I love the ombre colors! To say that I am thrilled for you is an understatement!!! Way to go V!!!! Enjoy this moment....love the colors and the ombre too. Shut the front door! Congratulations! For the record, I'm not a fan of most pastel shades (especially pink), but I love the darker shades because they seem stronger to me. How exciting! I can't wait until it hits the stores. Congratulations. Congrats ! The ombré is beautiful ! Way to go! These look yummy. The ombre loospks fun. Thinking of the projects . . .
Oh my gosh! Congrats on the line!! Ombre jelly roll?! This is beyond awesome. Congratulations on your creation! Congratulations! OMG!! It is ALL gorgeous! So excited for you. They will be on my shopping list for sure. Go you! Congratulations. I can't wait to see what you come up with. Especially the ombre strips. I love them but have no idea what I'd make with them so I'm super keen to be inspired by you. All the best. PS. Why when anyone leaves a negative comment do they sign in as anonymous? Seriously - if you've got something to say have the balls to stand by it! I'd be pooping my pants too Vanessa - but you're a star, you'll nail it!! oh, my gosh!! you don't stop, girl!!! congratulations! it looks amazing! 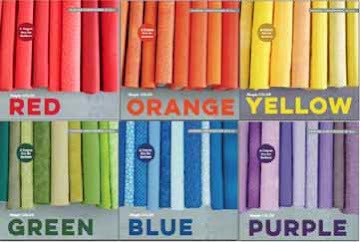 this must be divine providence because I thinking about making an ombre quilt for one of my boys!! !now I won't have to go buy the fabric but just order a roll and it's all in there! brilliant! OMG, OMG, OMG!!! i have never seen such cool fabric as Ombre!!!!! I LOVE IT!! there is so much you could do with that! Ummm I think I will HAVE to get me a few dozen jelly rolls of this! congrats on YOUR first ever fabric line! Awesome fabrics! The ombre = genius! WOOHOO!!! Congratulations -- You Rock V!!!! I love your ombre fabrics!!!! Holy cow - I can't wait to buy some! In yardage! I will watch for when I can! Any dates? Where will it be sold? 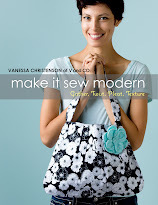 I love your book - I am doing some projects from it right now! Oh Boy! So much fun. I am sold. When can I buy it in yardage? Straight cool. Not cute, or fancy, just cool. That is one line I will be buying all of. Good job! Congratulations!! This is so awesome! I love your style so I'm sure I will love your fabric too. I LOVE the ombre! Please Please Please tell me when I can get some of that ombre fabric it is amazing!!!!! I am so in love with ombre. I MUST get my hands on the gray and pink!!!! Eeek! So amazing! I'm not usually a pre-cuts person, but some of those ombré jelly rolls are a must! Congratulations!! That is really awesome! I LOVE the ombre...it really gets my creative mind a buzzing. Congrats again! Yey! I can't wait to purchase the ombre strips! Holy crap... I am thinking of soooo many projects... Congrats to you! Loving those colors! Seriously swoon worthy. Congrats! 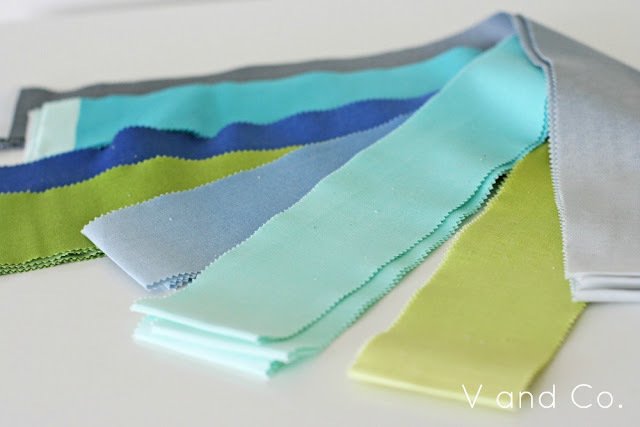 I love the idea of quilting with some ombre fabric! They're beautiful (and I feel much better, cuz I was a little disappointed when I thought they were just some boring ol' pastels. I should have known better!). This is so exciting! Congrats on your first line..I love it!! Cannot wait to get some! gasp! I'll be there! the international quilt market, right? Congrats, it looks awessome! Can't wait to see more of it! Wow...That's a big deal. Congrats and good luck sewing and getting ready for Market. Can't wait to see what you do! Very Exciting, I really like teh prints and I hope I am able to get my hands on a jelly roll and charm square to play with! I love teh solid flux colored strips! 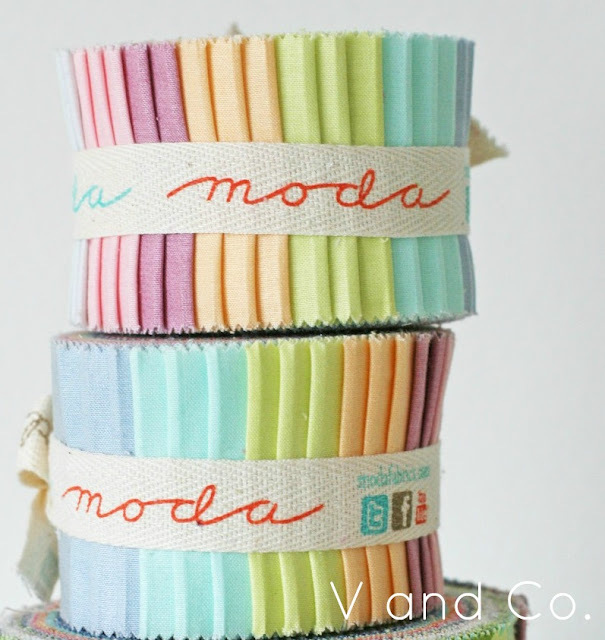 LOVE the ombre jelly roll! Congratulations! Every fabric lover's dream! Oh, and nice ombré, hombré. My mouth is actually drooling - had to wipe it off before it messed my keyboard up. 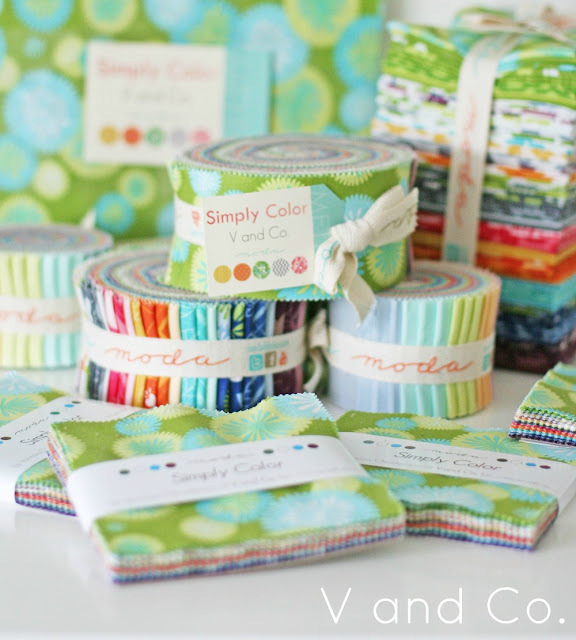 This is beautiful - can't wait to see it out there - nice sherberty summer quilts! YUM-YUM! Congratulations! Wow, it is absolutely stunningly shockingly amazingly beautiful! I can't wait to get my hands on it.... I freaking love the ombré!!!! You are too cool, and too talented, and too inspiring for words!!!! AMAZEBALLS! OMG!!!! Divine, simply Divine and to Die for!!! Can't wait to get my hot little hands on it!!! Congratulations!!! Dear Vanessa: could you please stop being so amazing? It's just not good for my self-esteem. :) j/p THESE ARE GORGEOUS!!!!! Congratulations! These are beautiful fabrics. You have created a line of fabrics in all my favortie colors. Thank you for sharing all your telents with us. I'm so happy for you! This is amazing, and so pretty.... I can't wait to buy some! I can't wait to find this fabric. My husband wants a quilt that needs the gradated fabric and I haven't been able to find any. Congratulations on your new fabric line! It's lovely. 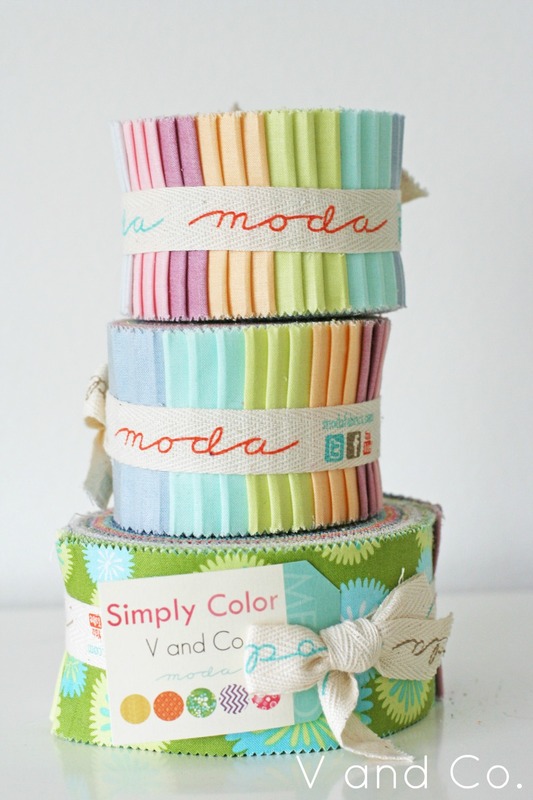 I especially like the ombre jelly roll. The prints look great too. I'm glad you added eggplant because I love that color. So nice to see the line! I can't wait to see what you do. So many congratulations to you! Those colors are amazing! Can't wait to see more. Lucky you! I agree. I love this fabric! Oh man, Vanessa...it's just GORGEOUS!! I'm so excited for you - congrats! I cannot wait to buy the whole darn line! congratulations little lady!!! you have hit the big time now! :D BIG HUG!! visiting from Bonnie's post! love blog tours! I love your fabric...cant wait to get me some of that! I am a traditional quilter, but am targeting bright sunny happy colors, yours are just the thing! In Pats book, love the Antique Splendor quilt, would be lovely in your ombres! how cool is that?! Congrats! I lvoe the colors!! Yup -- pretty darn cool! OMG poop is such a little word,can I use a bigger one? Oh, okay, well their wasn't anyone here when it exploded out of my mouth when I saw the fabric. I promise I won't use it here. Girl you love my colors and you have made them more gorgeous then I have ever seen. Definitely fondling fabric! See you at Spring Market, can't wait. Mouth will be potty free while I am there, :). Can't wait to see what magic you have done with the fabric. Uhmmm, I'll take 10 yards of each, NO WAIT, that was the excitement talking, Steve would kill me dead if that arrived at our door, he would know right off that I didn't win it. C U in KC, just look for the fat waddling lady, and no, I am not kidding. The last round of steroid treatments put 30 pounds in my face and belly. Okay, the fat faced lady with the big belly is who you need to look for! Love all those fabrics! It is like a color box of crayons with sooo many choices of the rainbow! Thanks and congrats. Yay!!! So glad you can finally let the cat out of the bag. It looks gorgeous, I can't wait to see it in person. Congratulations, friend!!! See you soon! I absolutely LOVE this line! It's beautiful, for sure :) I wish I could afford to buy a fat quarter pack of the entire line, lol. I think I just found the fabric I've been looking for. Congratulations! I can already imagine all those lovely new quilts in your rainbow fabric. The ombre is a brilliant idea, too. I thought I was following your blog already and I'm so glad I found it again. 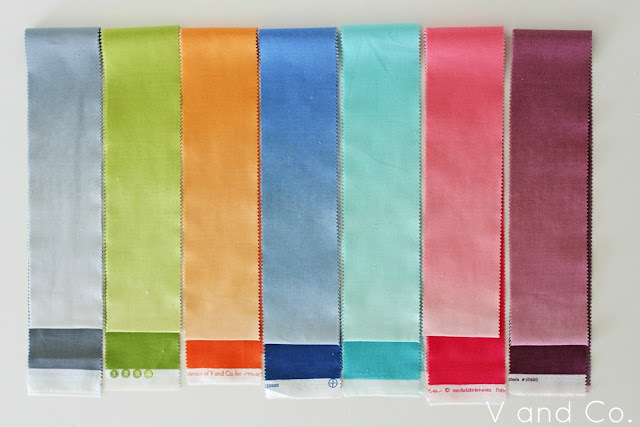 Congratulations on your line of fabric I love ombre and can't wait to see all your prints! Dude! An ombre jelly roll? Brilliant!! Very colorful and of-course I must say, the choice of color is really nice.